These festive quesadillas are packed with flavorful vegetables. Make Ranch Sauce by mixing 1/2 cup yogurt and ranch dressing in small bowl. Set aside. Make Zesty Sauce by mixing 1/2 cup yogurt and salsa in small bowl. Set aside. Rinse pepper. Cut off the stem end and remove seeds. Chop into small pieces on clean cutting board. Rinse zucchini. Peel if you like. Chop into small pieces on cutting board. Put a colander in the sink. Pour beans into the colander and rinse. Place one tortilla on a dinner plate. Spread 1/8 of beans on one half of a tortilla. Mash beans with a fork. Top with 1/8 cup of the pepper and 1/8 cup of the zucchini. Sprinkle with 2 Tbsp of cheese. Repeat process to make remaining quesadillas. 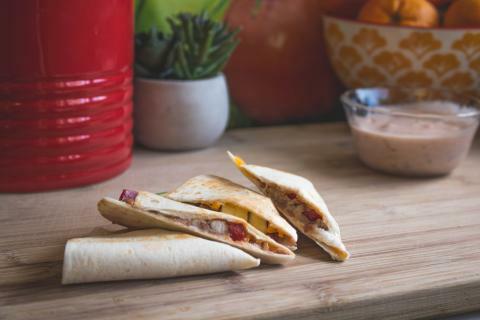 Slide one quesadilla into a nonstick skillet or skillet sprayed with non-stick spray. Cook on medium heat for 2-3 minutes or until the bottom of tortilla is crisp and light brown. Fold plain side of tortilla over the side with vegetables using a pancake turner. Slide out of pan carefully onto a plate and cover with foil to keep warm. Cut in half. Repeat with rest of tortillas. Serve with Ranch Sauce and Zesty Sauce on the side.